When you sell software as a service (commonly known as SaaS), it's par for the course to create multiple pricing tiers with varying limitations or features based on how much you want a customer to pay each month. We did just that when we launched. We originally had three upgrade plans--Plus, Premium and Max--varying in price from $12/month to $48/month. You could get more surveys, responses and features by upgrading. But it always felt a little odd. 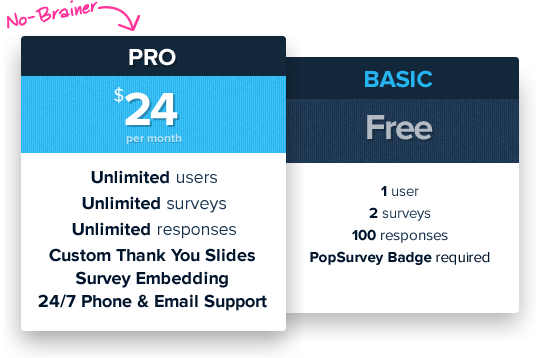 We built PopSurvey because we were tired of complex survey software and overbearing feature sets that took too long to figure out. So, why would we make our pricing complicated? Well now it isn't. Today we're trying a little experiment. Starting today there's one upgrade option, and it's good...really good. For $24/month you get unlimited everything. Unlimited surveys. Unlimited responses. Unlimited users. And you get every feature we've got. No more comparing plans wondering which will fit your business best. No more comparing different pricing tiers to competitors trying to figure out which one will save you the most money. One upgrade price and you get the whole thing. For the online survey industry, this is absolutely out of the norm...but we've never been a company to do things the "normal" way. Enjoy.